The Chase Australia Mkr Special is a TV show on Australian national television from Seven with an average rating of 3.0 stars by TVCatchUpAustralia.com's visitors. We have 3 episodes of The Chase Australia Mkr Special in our archive. 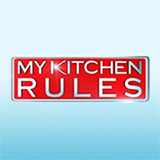 The first episode of The Chase Australia Mkr Special was broadcast in March, 2017. Did you miss an episode of The Chase Australia Mkr Special but don't you wan't that to happen in the future? Please set an alarm and add The Chase Australia Mkr Special to your favourites, so we can remind you by email when there's a new episode available to watch. Completely free: handy! In a delicious special episode, the Chaser will take on the stars from My Kitchen Rules. The culinary couples will pack up their pots and pans and work as one team to take down the Chaser. In a delicious special episode, the Chaser will take on the stars from My Kitchen Rules. The culinary couples will work as one team to take down the Chaser.